The two will be setting together in the west, in the constellation Sagittarius. 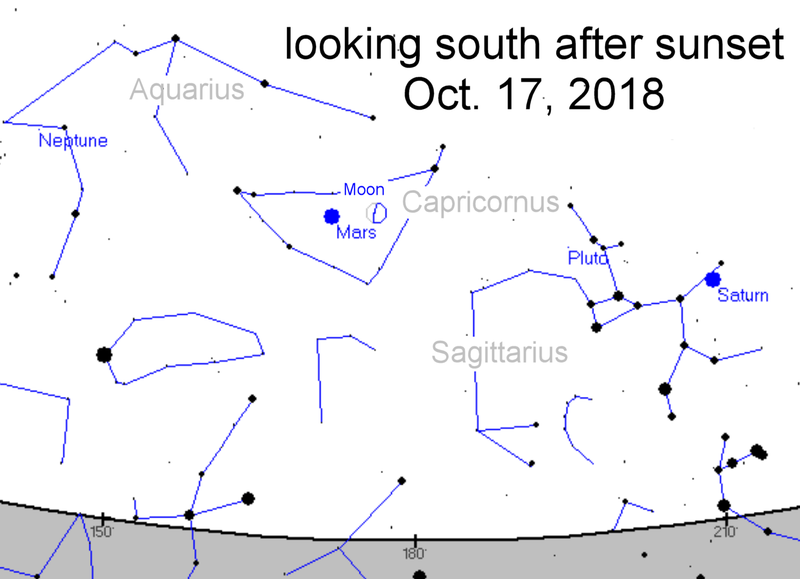 The 12.5-day-old Moon will have Saturn to its lower left, the pair remaining fewer than one-and-a-half degrees apart the whole time. At 12:54am Saturn will be thirty-one degrees up, and nineteen degrees up at 2:24am. The two will be setting together in the west, in the constellation Libra. The 6.2-day-old Moon will have Jupiter to its left, the pair remaining fewer than seven degrees apart the whole time. At 9:19pm both will be twenty-six degrees up, and fifteen degrees up at 10:19pm. The two will be setting together in the west, the Moon in the Sagittarius and Mars in Capricornus. 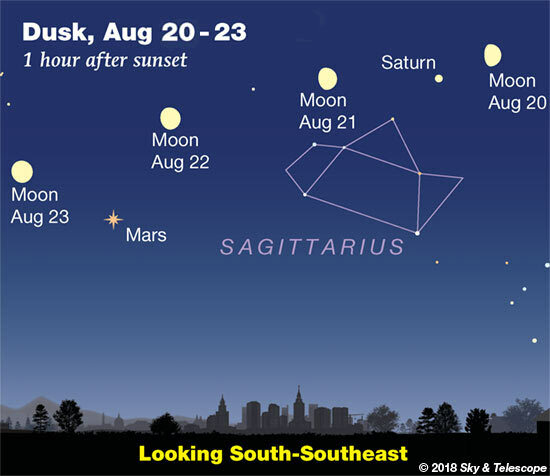 The 11.9-day-old Moon will have Mars to its left, the pair remaining fewer than eight degrees apart the whole time. At 2:02am Mars will be nineteen degrees up, and both will be fifteen degrees up at 2:32am. The two will be setting together in the west in the constellation Sagittarius. The 5.8-day-old Moon will have Saturn to its left, the pair remaining fewer than two degrees apart the whole time. At 7:56pm Saturn will be twenty-eight degrees up, and both will be fifteen degrees up at 9:26pm. The two will be setting together in the west in the constellation Capricornus. The 8.6-day-old Moon will have Saturn to its upper left, the pair remaining fewer than five degrees apart the whole time. At 11:03pm the Moon will be twenty-four degrees up, and fifteen degrees up at 12:03pm.